16 brand new Bots, with some quirky new game mechanics! 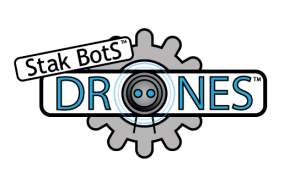 Please join us and help get these new Bots out of the factory! After a massively delayed journey at the hands of Southern Rail and their farcical replacement bus service, I finally made it back home last night from my first Conquest event in Shoreham-by-Sea on the South Coast. 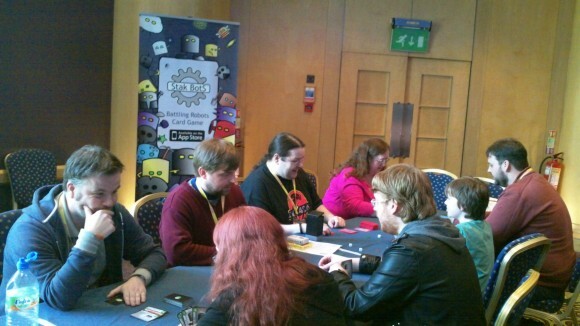 They were a very welcoming bunch and it was lovely to catch up with a few game and comic devs as well. 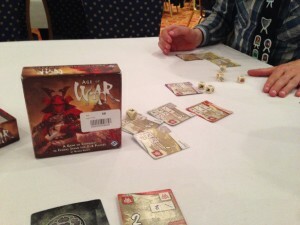 Most of the day was spent either introducing new players to the Bots, or showing the new ‘Stak UP’ game variation (2-player mode introduced in the new Red Set, where you raise up your Staks from nothing). Me vs a very large Stak! I also managed to finally sneak in a game of Oligarchy with its vivid designer Gary (a poignantly stark game theme with some clever faction mechanics) and got a look at the new Final Fantasy cards (judgement reserved until I get a chance to play, but the card stock is lovely!!). At the end of the day we had the final for the Stak Bots tournament. 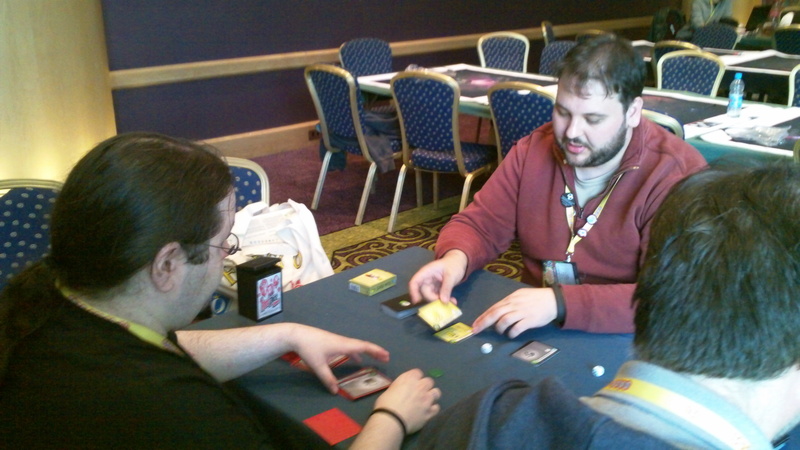 Both cards were revealed simultaneously after an attack, with Alex (on the right) down to his very last card. 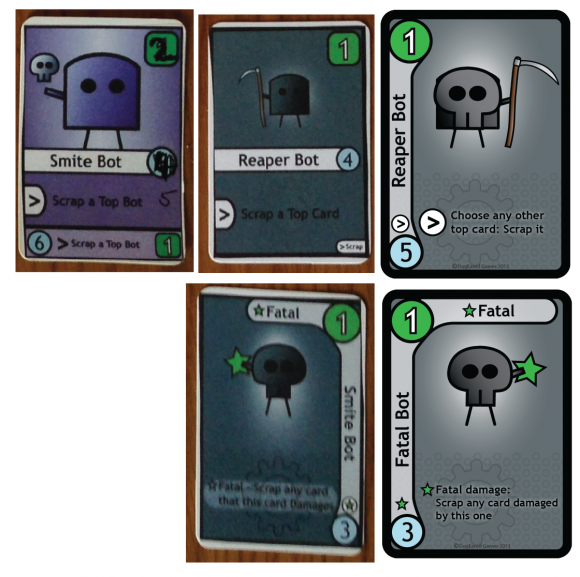 Unfortunately for Elliott that last card was the horrifically damaging Spike Shot Bot and Alex had priority after attacking, so was able to eliminate Elliott’s last two cards before his Shot had a chance to fire! Incredibly close game! Thanks to Gambit Gary and the rest of the team for putting on a great event and we’ll see you again next year for another great Conquest! I have recently moved house and been forced to go through boxes and boxes of my old tat, in order to try and downsize a bit. As tedious as this process is, there has been one odd little bonus; I’ve found lots of the original Stak Bots cards from the game’s 2 year development process leading up to the first print, so I thought I’d share a little of the background the game and the Bots themselves. Let’s kick things off with that most core of Bots… Bladed Surveyor?!? 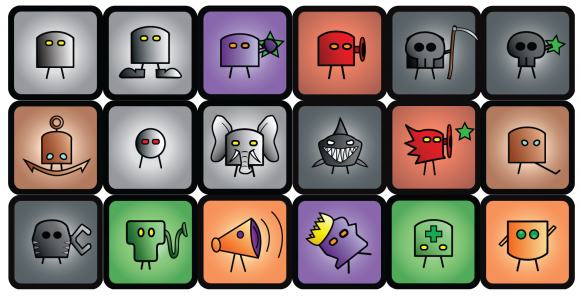 Long before Stak Bots had anything to do with stacks of Bots it was a completely different game. Then another completely different game, then another, etc etc. 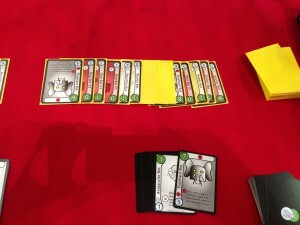 There was a whole faction of robots that sat within a larger framework of other cards and Bladed Surveyor was the one that most closely resembled the Bots of today. Core Bot (or Basic Bot as it used to be known) is about as simple as it gets visually, but even this design has changed a lot, just in lots of tiny little ways! Leg Bot… I really don’t know what to say about this one! Out of necessity in the next incarnation of the game it changed into Stomp Bot and gained a smashing pair of boots in the process. As you can see from the second picture, the sidebar used to be at the bottom (from when the game played like Stak UP, the impending variation in the upcoming Red Set), then it was on the right hand side (from when I neglected to consider that unlike myself, most people are right-handed), then finally it found its way to the left. 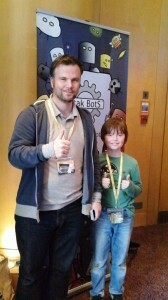 Bash Bot hasn’t really changed all that much, apart from looking slightly more menacing rather than just… confused. And it actually has what the card does written on it, rather than just some scribbles!! (Writing out lots of cards for prototyping can be tedious!) 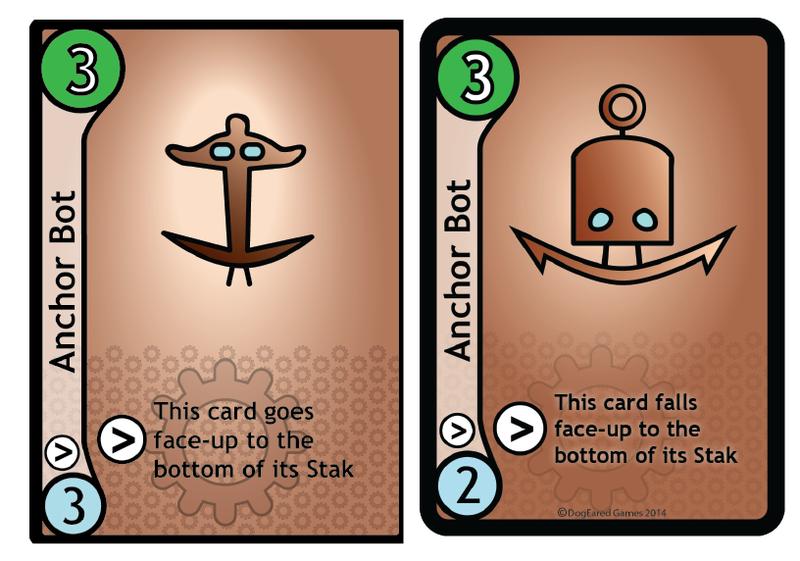 For the keen eyed, the text of Bash Bot has been re-written many, many times to make it as concise and clear as possible (which is still a garbled mess), so the final card above isn’t actually the final card. 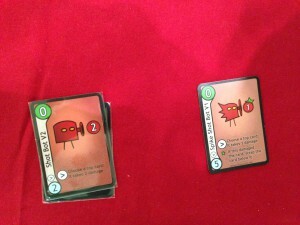 Shot Bot, along with Core and Bash made up the mighty trio that served the game through much of its transition as it settled into the final printed form of Stak Bots. The Shot character evolved slightly, from being a one-eyed fire hydrant, to a wide-eyed tiny thing with eye studs, before reaching its final form. Even the bullet kept changing, so it’s more like a pea-shooter now than whatever else it was originally. 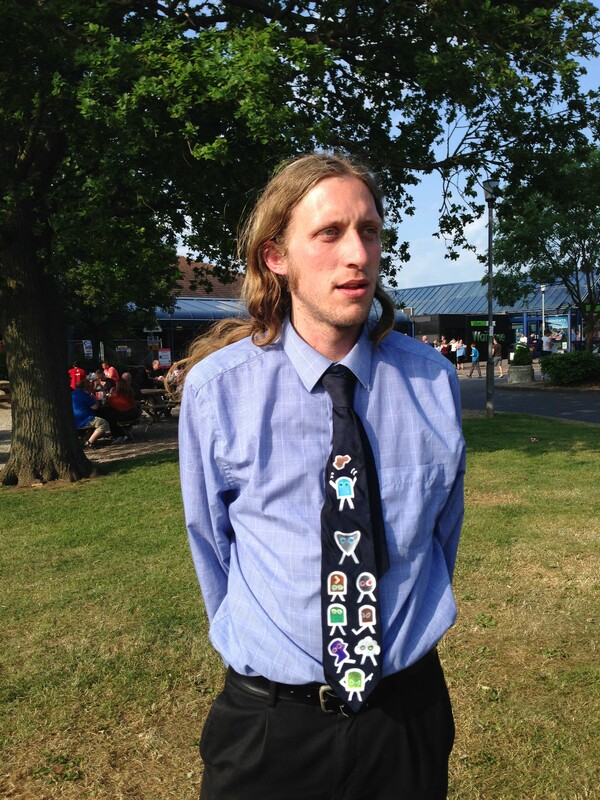 Smite Bot…. oh how I wanted to call a card Smite Bot. But as the cards solidified into their functions, it just wasn’t appropriate. 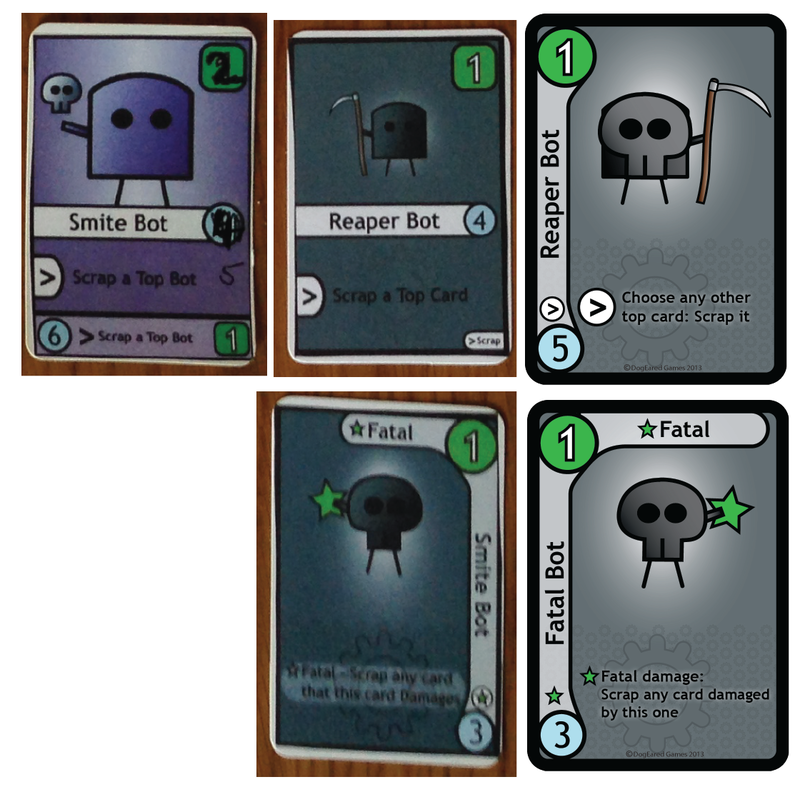 Reaper Bot’s original look had it holding a levitating dismembered Fatal Bot, which it swapped for a scythe, then got the Fatal Bot back and stuck it on its face. Who knows why these dark creatures do what they do?!? One day the Smite Bot name will return to the game… one day. 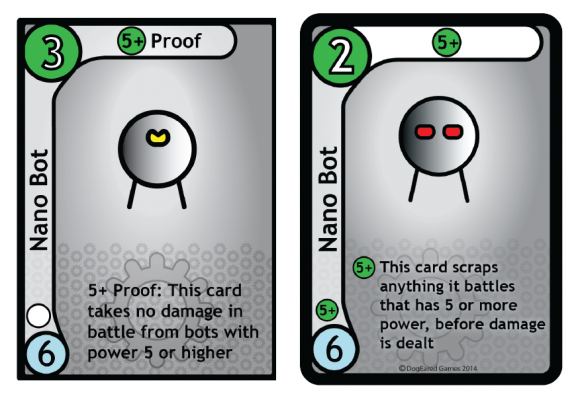 Although it’s not from as far back as the previous cards, Nano Bot’s transition is worth a mention. The main challenge with this card was to make it as ominous looking as possible, so cold dead red eyes seemed to work better than… a dead pacman?! It also used to take no damage rather than outright defeating big Bots, but this led to tedious repeat attacks to kill cards, so it got made more deadly. It also had to have its power reduced as it just kept winning. Horrible little thing! As well as being grotesque, the original Anchor Bot stood zero chance of being able to stand upright. Maybe that was the point? 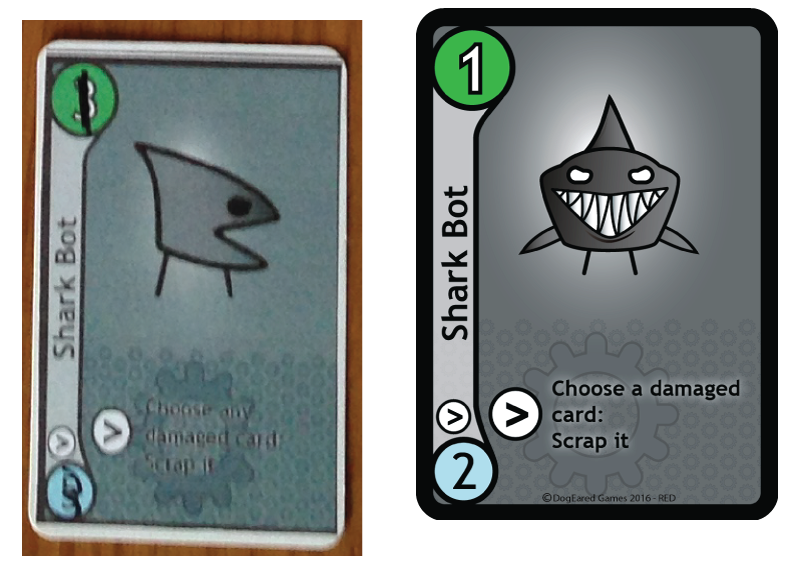 A lot of time was later spent on Shark Bot as there was absolutely nothing intimidating or sharky about its first appearance. 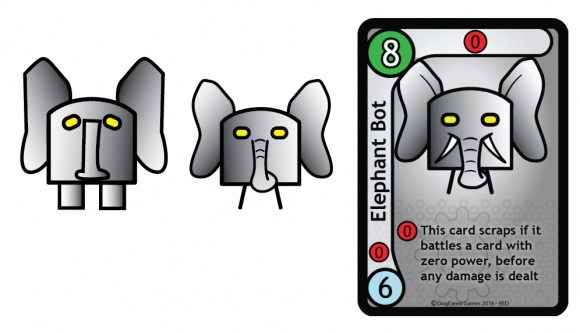 My lowest point as an artist, I present for your amusement the original Elephant Bot. It was so bad I couldn’t even bring myself to print this one!! 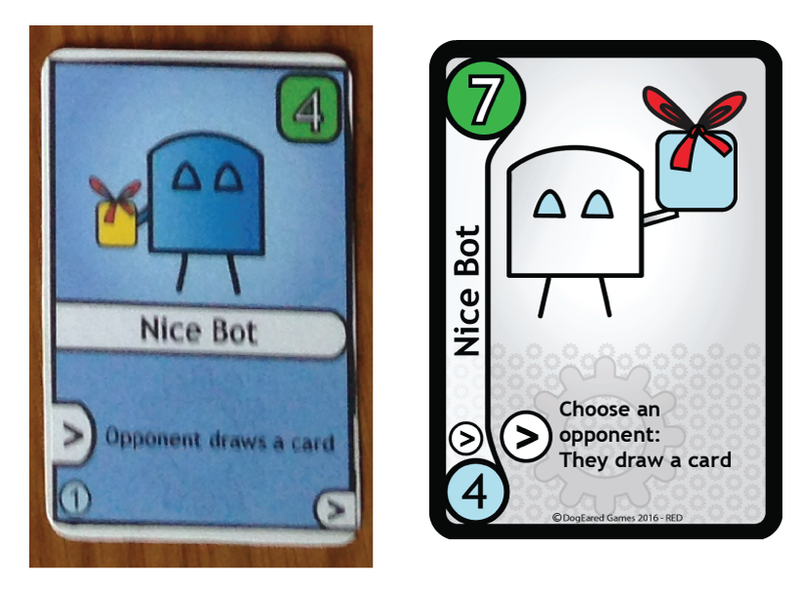 Nice Bot didn’t actually change much, but it was a fairly early creation that has only just managed to get into printed form in the Red Set. There are many other Bots lurking in the prototype pile that will hopefully slowly find their way out! It also shows yet another card layout. They were incredibly happy yet sad days, whenever I had a brainwave about improving the card layout, then subsequently realising I would have to re-print and re-make every single card in the game again. 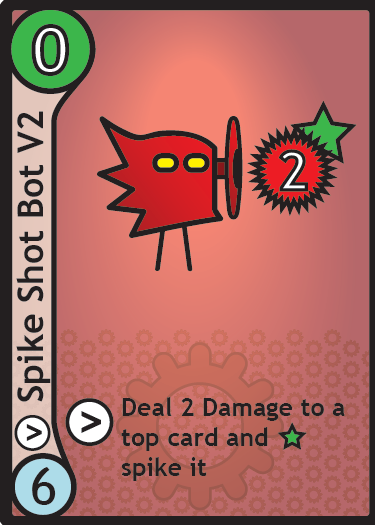 Spike Shot Bot, the next expansion’s poster child, used to be a bit naff. 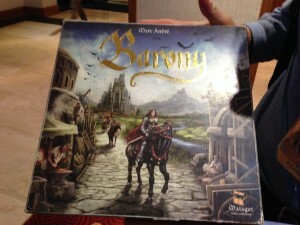 I cannot see either of the originals finding its way onto the front of a game box! It also nicely demonstrates the indecision about how much text needs to be included for concepts that players have already encountered on other cards. 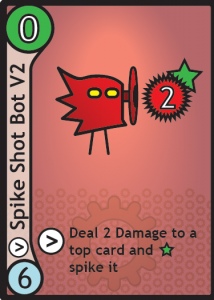 If they’re familiar with the game, then saying ‘spike it’ should be sufficient, but if they’ve never seen a Spike Bot then who knows what they’d do?! It could either involve scissors or drink and neither of these are appropriate. OK, I’ve saved the worst for last. 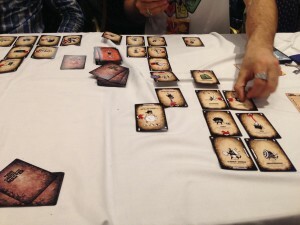 The trip mechanic whereby a card falls down one place, used to be called soak. The idea was that a Bot would get so water-logged that it would sink down a bit through the Stak. Unfortunately this led to some rather unhygienic cards. I didn’t like the concept of a Bot that would spit on you repeatedly until you were so weighed down that you fell over, so it got changed to the cheeky little Trip Bot. It did however allow a very dubious card to come into existence. 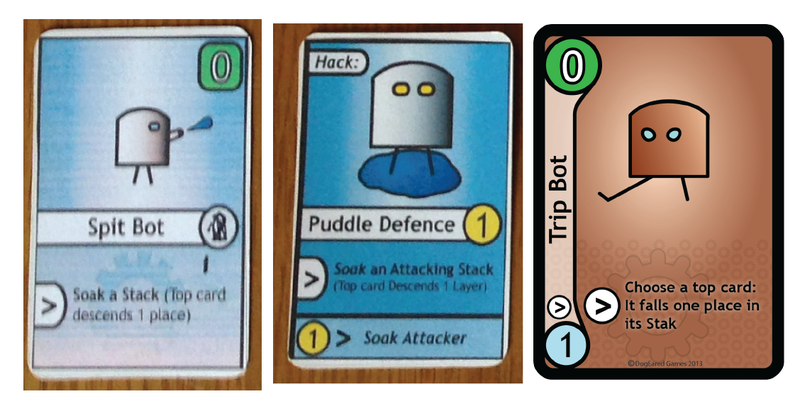 The game used to have Hack cards you could play, which would have one-off effects but couldn’t do any attacking. 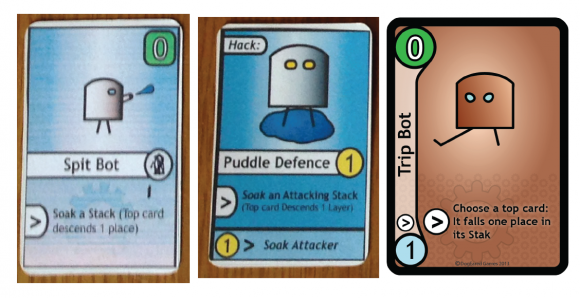 The Puddle Defence let you play a card when you got attacked, which caused your defending card to make a puddle, which would soak the attacker in its noxious substance until it fell over…. awful awful awful. So as you’ve seen, many of the Bots and the game itself has changed a lot over the years. The game is about to go through another change, where the Bots have shrunk down into little tiles so that more can fit on the screen at once for Stak Bots ‘Breakout’. This incredibly difficult puzzle game is currently on Steam Greenlight, so if you’d like to see the Bots change once more (as well as meet a number of completely new ones), then please visit the page and vote / comment. What did you think to the evolution of the Bots? Well, we survived another event! It was long and exhausting (especially after contending with the hotel’s attempt at a bed. Photo at the bottom! ), but ultimately it was as enjoyable as ever! 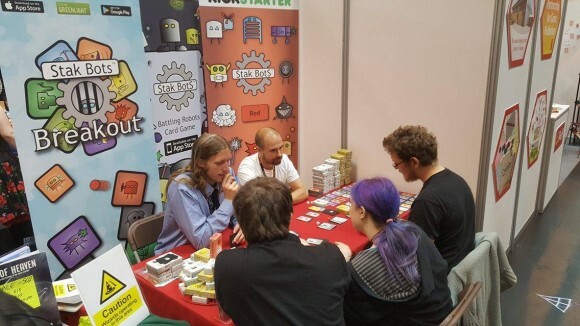 We were overwhelmed by how many people came up to the stand saying that they loved the game, or had been told to come and get it by a friend. 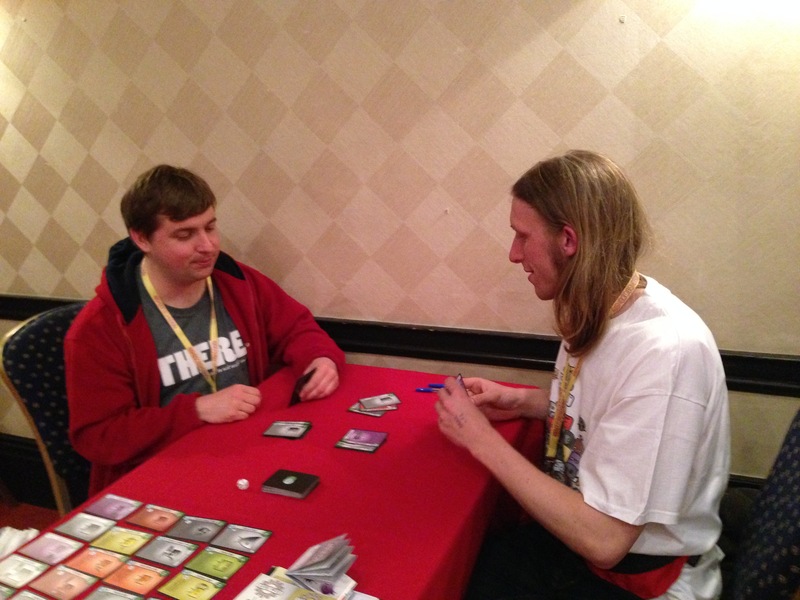 We even had people try to buy our demo copies of the unprinted Red Expansion! Things got off to a great start on the Kickstarter for the Red set, and at the time of writing we are on the borderline of reaching halfway to our goal! So if you know anyone who might be interested, please send them this link and help tip us over! It was also great (once I managed to escape the stand for a bit) to be able to catch up with a few friends from previous years (like the awesome Mike ( http://www.whodaresrolls.com/ ) and Chris ( http://www.ukgmn.co.uk/ ) on their filming adventure, and the ever friendly DarkCleoPro gang to name but a few. 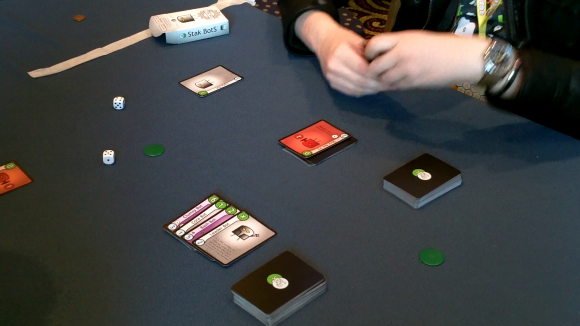 Yes, the first game we played at the end of a day of demoing Stak Bots was… Stak Bots. Well, with a game that is capable of so much complexity and variation, it can get frustrating only demoing the basic version of the game repeatedly! So we let loose and tried to ram as many modes in as possible. This was the beginning of trying to create Stak Bots ‘Ultra’, a mode so complex that we kept forgetting which rule toggles we were incorporating! This was the beginning, just playing with 3 Staks each and reactive play, with the grey, yellow and red sets all smooshed in together. This was the scrapheap at the close of play!! It was a long and hard fought battle! 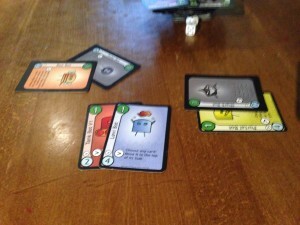 The ridiculous finish of the game: A Bee was used to reset a Pulse Bot that then eliminated all of the other cards on the table, which just happened to have the same power of 1! We both had hands full of cards ready to react to an attack, and enough cards on the Stak to survive a simple Shot or Reaper, but nothing had prepared us for this ending! A fun little game that saw us trying to sabotage and squish each other’s towers of dark squiggly monsters. 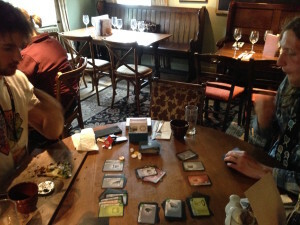 It was fairly straightforward to play and we chucked in the intermediate cards immediately; by the end of the game we’d worked out a reasonable grasp of the tactics and would have happily played a second time, but with the wealth of the games library in our grasp we were keen to smash through as many games as possible! 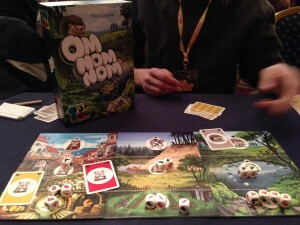 This looked like a fun simple little dice game, but turned out to just be frustrating and dull. Roll dice, see if they match a card. Steal it off your opponent. They steal it back. Repeat until you get bored. Or were we missing something?!? 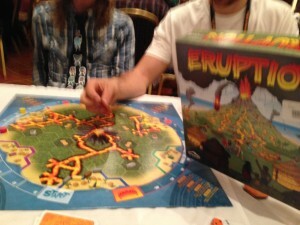 A strange game where lava rapidly surrounds your village walls at the edge of the board, and then your village slowly heats up until you die. Quite fun as a one-off. We got locked out of the board games library, so played some Bots while waiting for our neighbours to finish their game so we could join them in the next one. This time we added a blind hand in addition to the normal one, that could be played only in reaction to attacks. 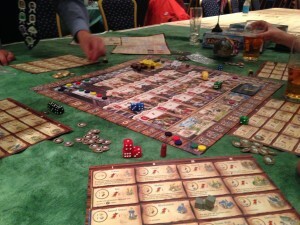 Our new pals from Pegasus Spiel kindly let us join them for this game; a nicely elaborate dice game with some good matching mechanics and building levelling. 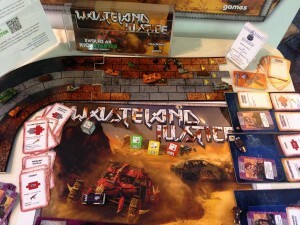 I didn’t get a chance to play this one as the demo table was full, but it looked pretty cool! Made me think of Carmageddon! They’re on kickstarter at the moment if you fancy a look. Basically sh*thead but with some clever card variations. Definitely worth playing if you’re a fan of the aforementioned! 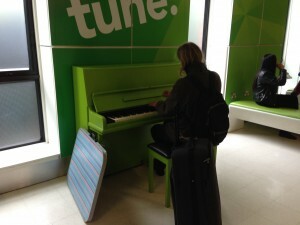 No photo as I was busy playing! 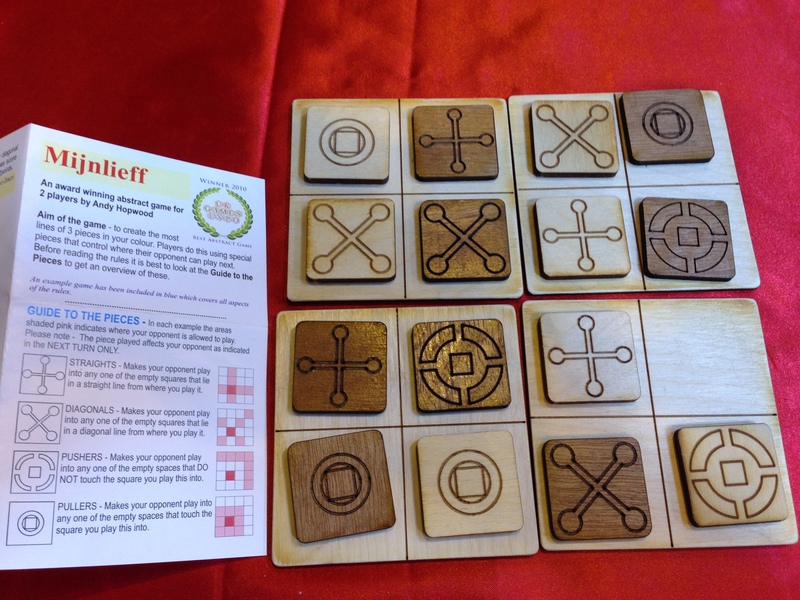 Clever little party game involving full body dexterity. 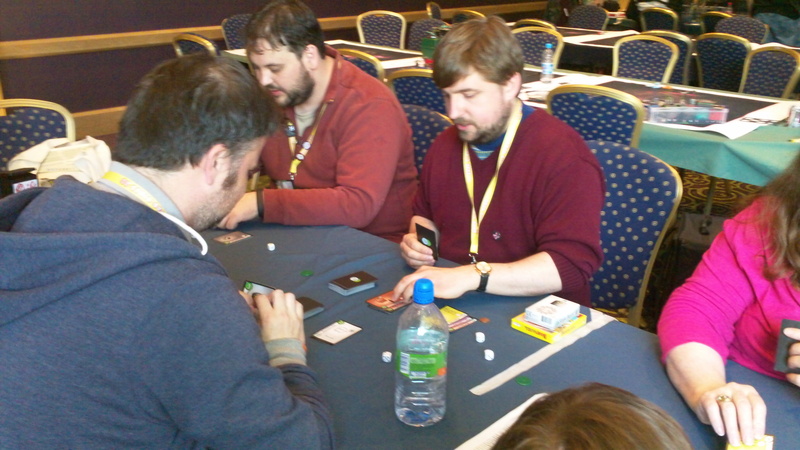 Despite some adept manoeuvres I lost to the guy demoing; in my defence, I’m pretty sure wearing glasses in a game where you have to attach a card to your eyebrow is cheating! I even bought a copy! All in all, another great expo, marred only by my new nemesis, the hotel ‘bed’!!! 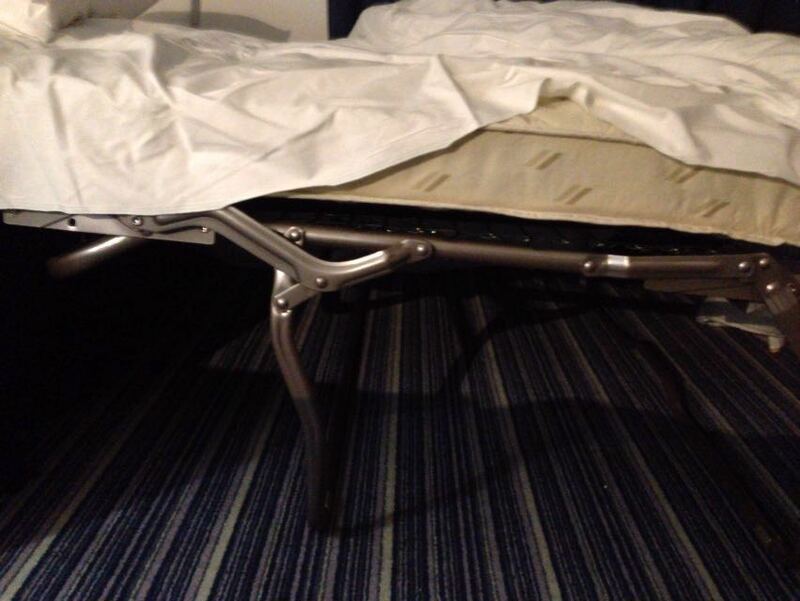 It was made of springs so I slept on the floor, curled up on a sofa cushion! So if I looked tired at the event, this was largely responsible!! Hopefully see you again next year UKGE! We’re back and slightly rested having survived another brilliant UK Games Expo! 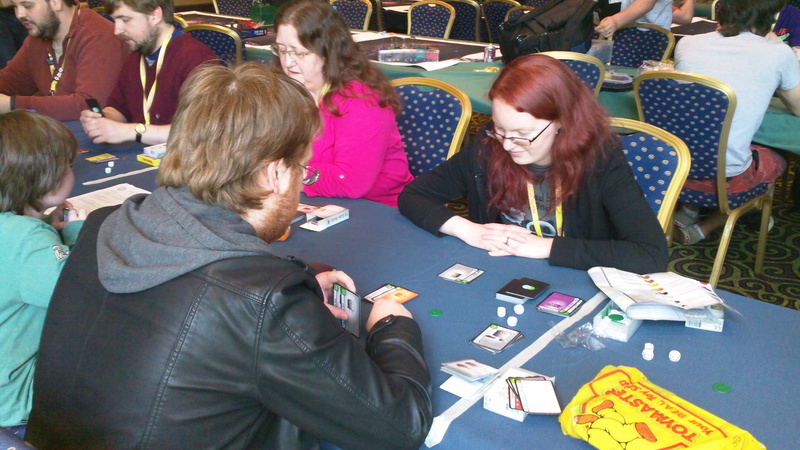 Having the event stretched over 3 days meant that we finally had time to actually get round some of the other stands, play some new games and catch-up with people! 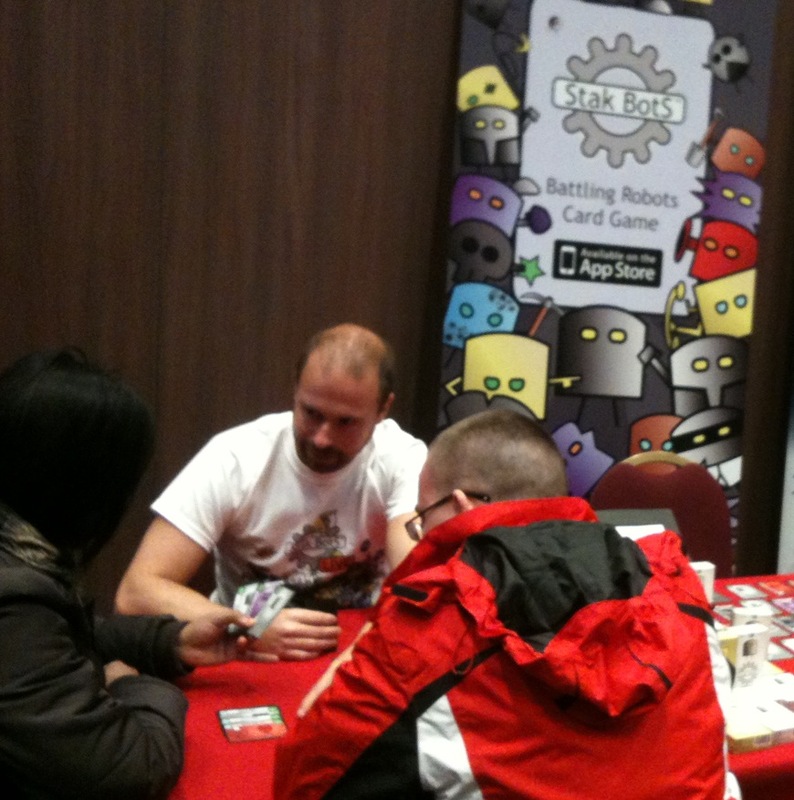 We had a great time at the Stak Bots stand and had some really interesting and chaotic games. We gave the upcoming expansion deck a bit of an airing and I reaffirmed my love for Spike Shot Bot. 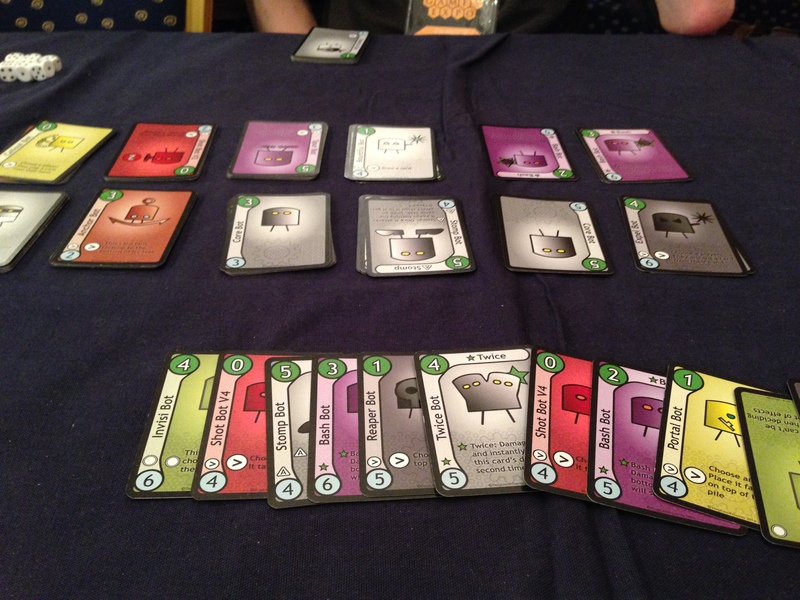 We also had some interesting exchanges where zero powered cards dominated the battlefield against hordes of Elephant Bots, causing powerful entry effect cards to be wasted getting rid of the tiny Bots before any damaging progress could be made! 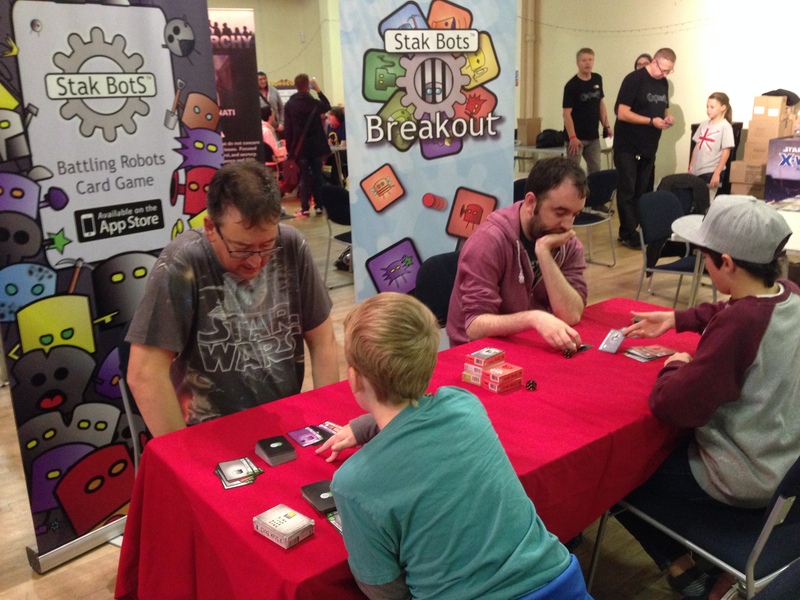 It was lovely to have so many returning players from previous events drop by for a game, some even wearing their Stak Bots t-shirts! Amazing! 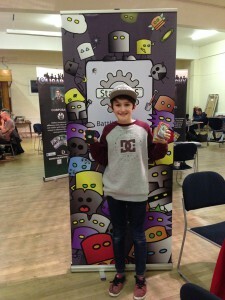 We also had the world champion drop by to wreck our robots! On the first night we got to check out the overwhelming might of the board games library! 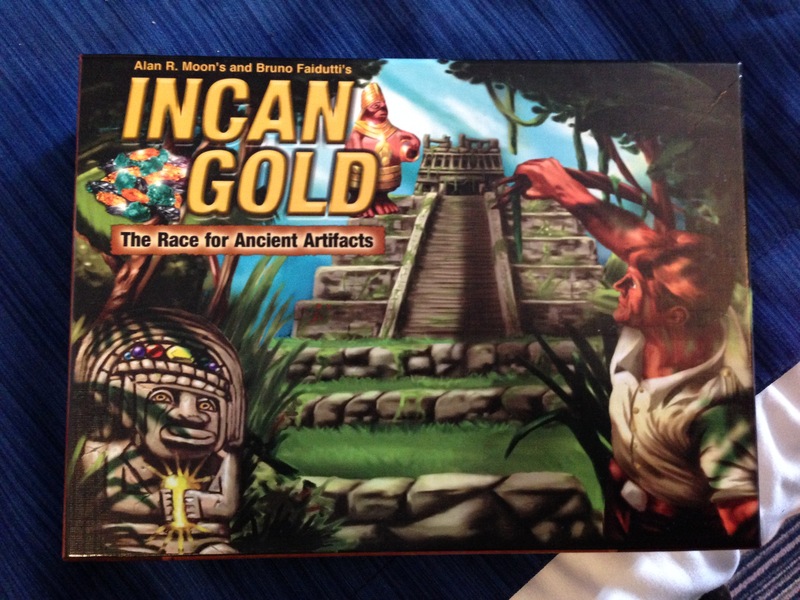 First up was Incan Gold; luckily the guy sat next to us knew how to play and explained the rules in seconds, so we piled straight in to this fun little game. On one of the later rounds I ‘accidentally’ dealt Mats two exit cards instead of the usual one entry and one exit, slightly limiting his tactical options. Ridiculously, he didn’t even notice as he decided to flee every single time and actually won! By the time we were finished the library had sadly closed, so we bust out the Bots to experiment with some new variations. 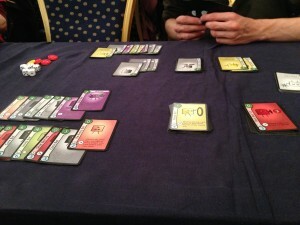 In the first game we decided to mix some modes up a bit and aim for high complexity. Having some Staks face-up and other face-down led to a nice mix of planned combos and blind luck! 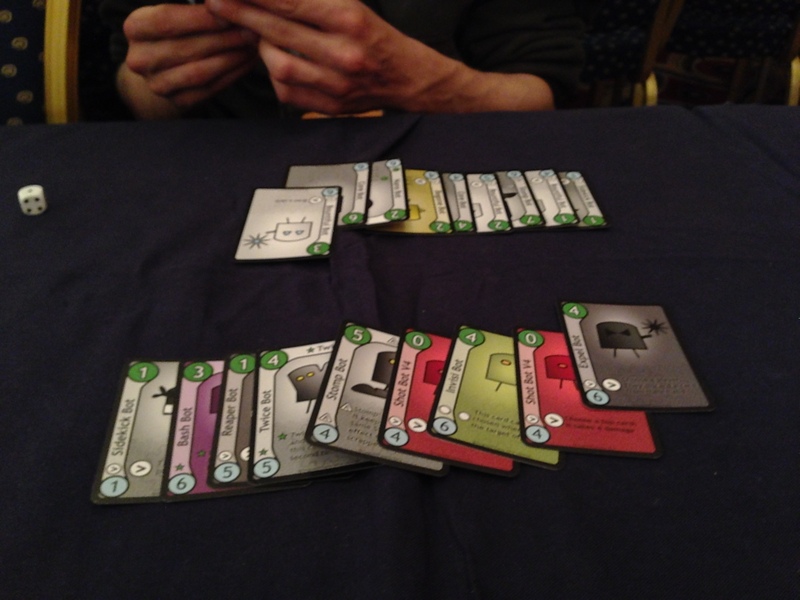 After this we experimented with a new way of drafting cards ready for an x-ray build-up game. For this draft, we lined up the cards opposite each other in their corresponding ranks. 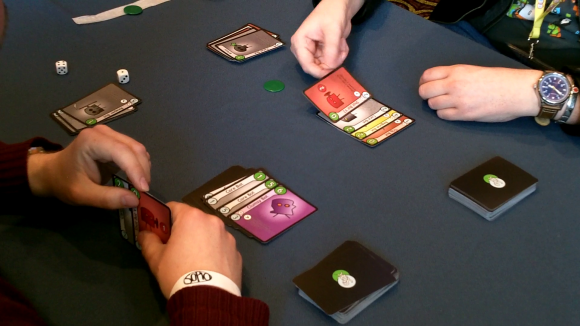 Each player took a turn to choose the top face-up card of one of the 6 ranks, and the other player had to choose the card of the same rank. This gave you some influence over your opponent’s deck content; for example, having forced a couple of Nano Bots into their hand, I tried to avoid picking high-power cards for myself to negate their Nano ability. 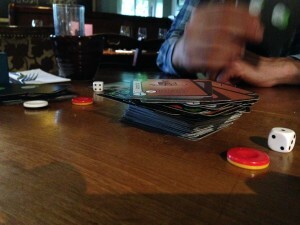 We then took turns to lay one card at a time face-up, until we each had a Stak of 9 deep with 3 in hand. We rolled for who took the first turn. This mode was great fun, with careful alignment and future planning in the build-up stage being completely ruined by a cunningly timed Levi Bot played from hand. We finished up the evening with a multitude of tea at the hotel and a few more games of Incan Gold. 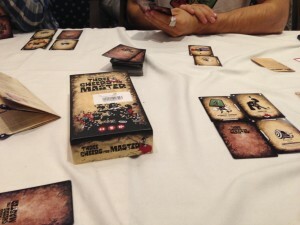 Knowing we had a full day of gaming on the Saturday, we turned in nice and early about 2am…. 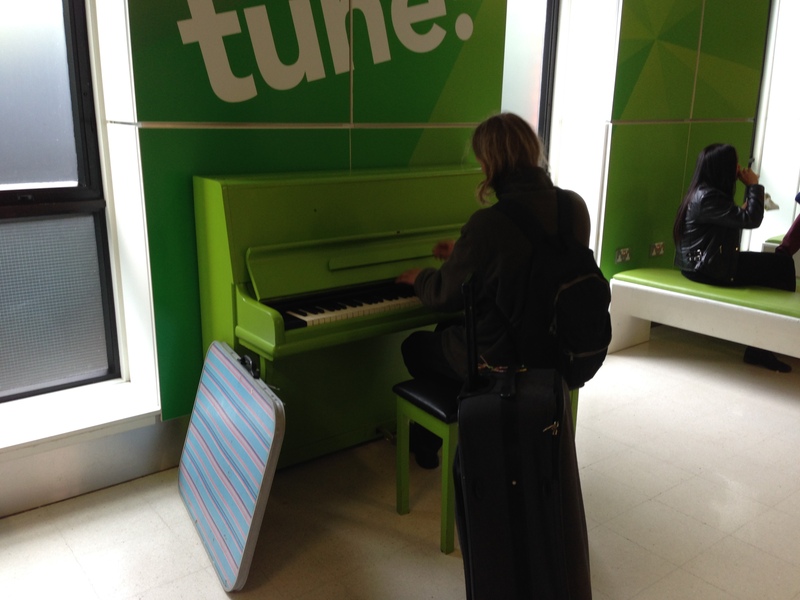 erm… oops. 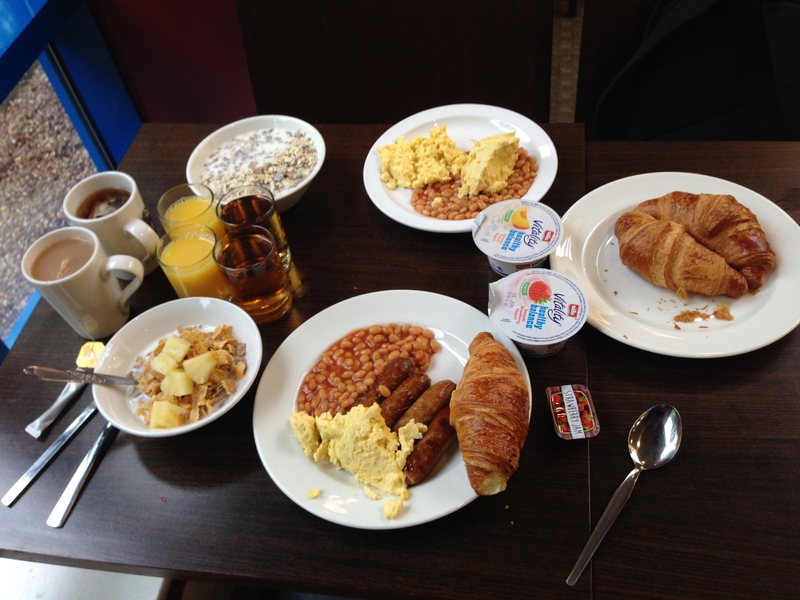 After feasting on the continental breakfast at the hotel (no lunch needed! Win! 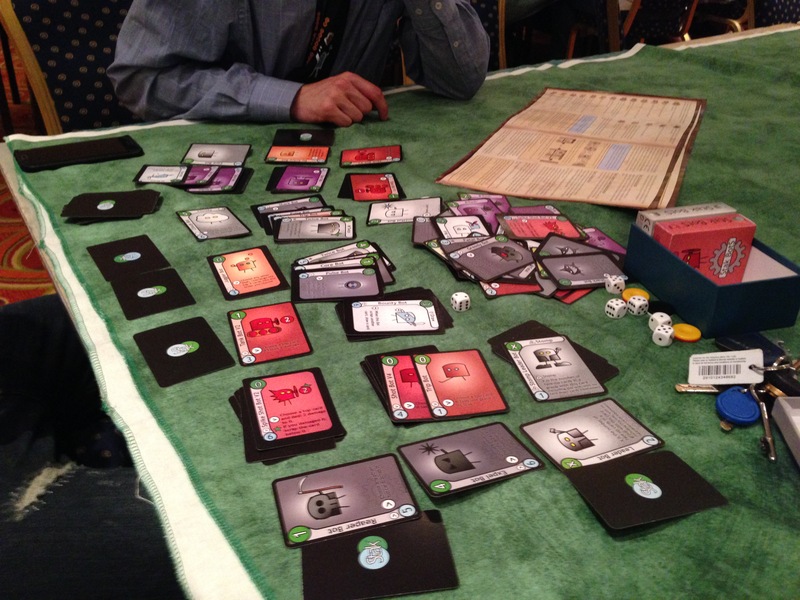 ), we had another full day of demoing, followed by a proper attack on the games library. Forbidden Desert – After cleaning out standard difficulty with two players, we turned the sand up to the max and died of dehydration a couple of moves from the end. A frustratingly sudden ending to what was quite a fun game. 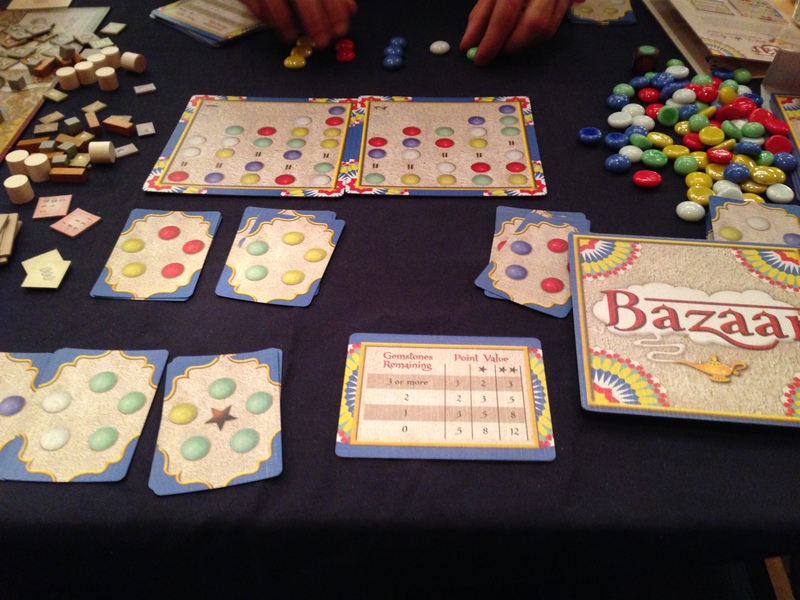 Bazaar – a little gem of a game (sorry!) 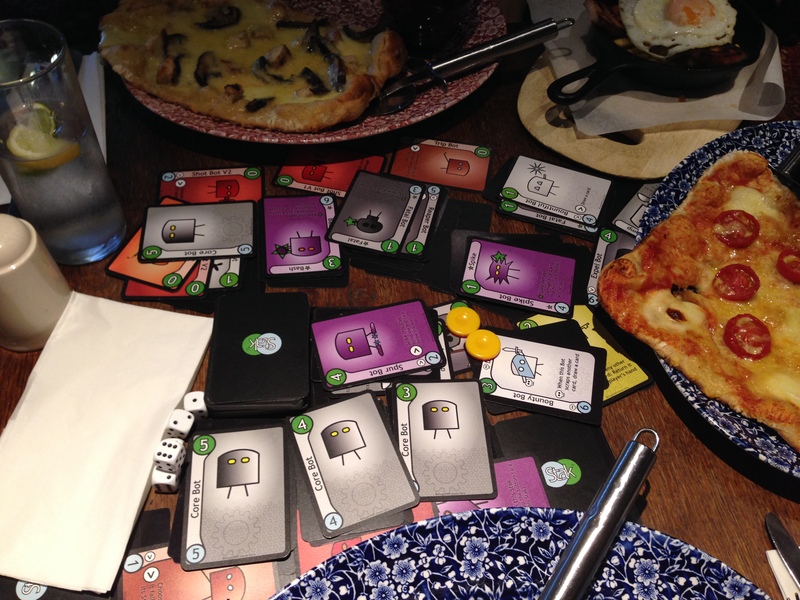 This incredibly clever little conversion game frazzled our brains; we thought we’d got the hang of it after the first time through, but the second play seemed somehow more taxing. 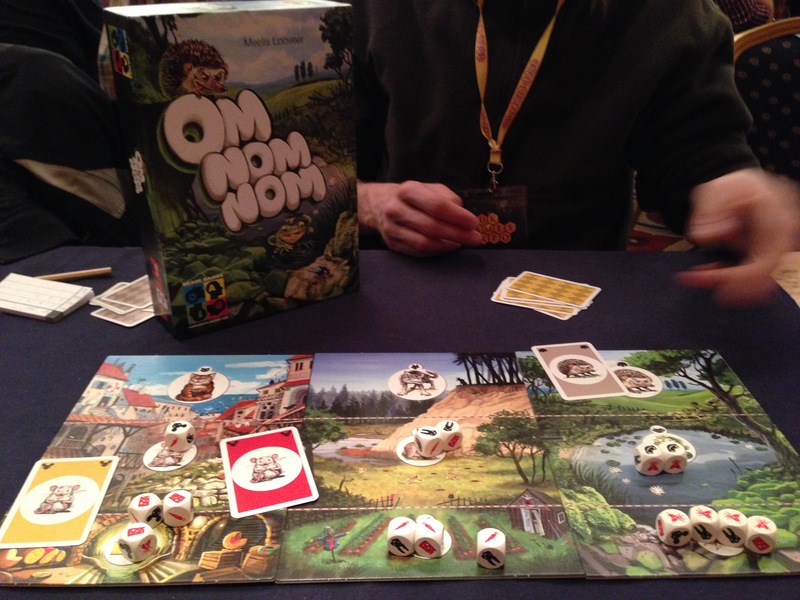 Om nom nom – not sure this worked properly with just two players (and a pretend 3rd player taking random moves which thrashed us! ), but the dice were awesome! Lost Cities board game – on the first play-through I hadn’t really listened to the rules and negated several key concepts such as not playing high cards early on, avoiding getting negative points and actually putting the giant guy on the board! Never has this game seen such a ridiculous point imbalance! The second time through was more balanced thankfully. 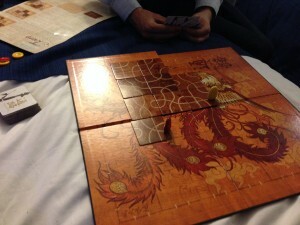 Tsuro – being too tired at this point to tackle anything resembling an instruction booklet, Tsuro was a perfect end of the evening game. 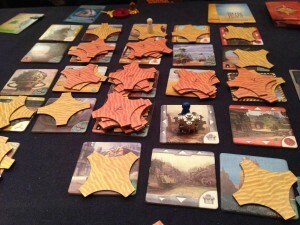 We wiggled our pieces around paths until everything got a bit blurry and it was definitely time to sleep! Jam / Sumo – our lovely stand neighbour Gavin had these beautiful hand-crafted wooden games which I finally got to play on the last day. 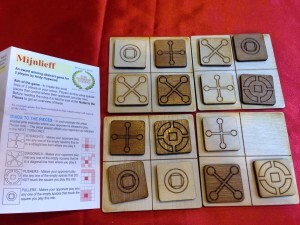 A fun dexterous dice-flicking game with a couple of ways to play. Brilliant! A little tip though: don’t take on the guy who has been sitting playing it solidly for several days, it won’t end well. 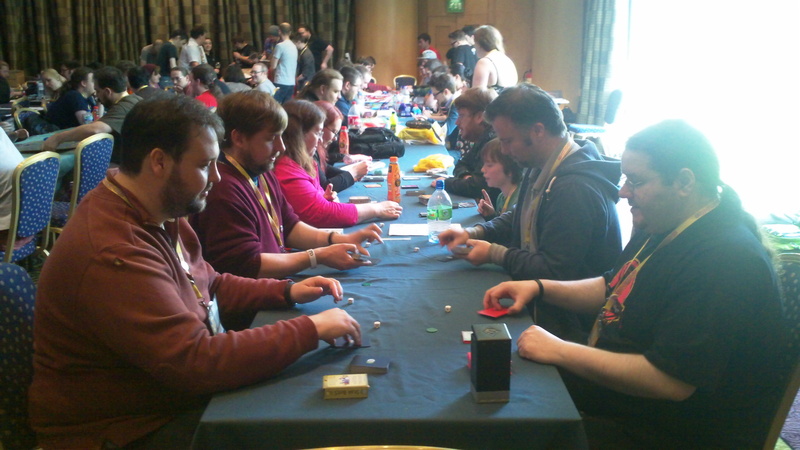 We eventually had to step back out into the sunlight and escape the timeless world of the UKGE, dragging our bags accompanied by Chris of the brilliant UK Gaming Media Network (good luck with the endless expo editing by the way!). 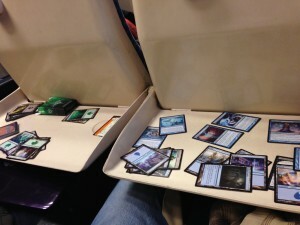 Mats entertained the NEC with a quick bit of Einaudi before we hopped on the train and squeezed in one last game – the financially destructive but ever-enticing MTG, using a duel deck I picked up in the closing minutes of the event. As ever a great event, thank-you to the organisers and everyone who attended and of course particular thanks to our players! 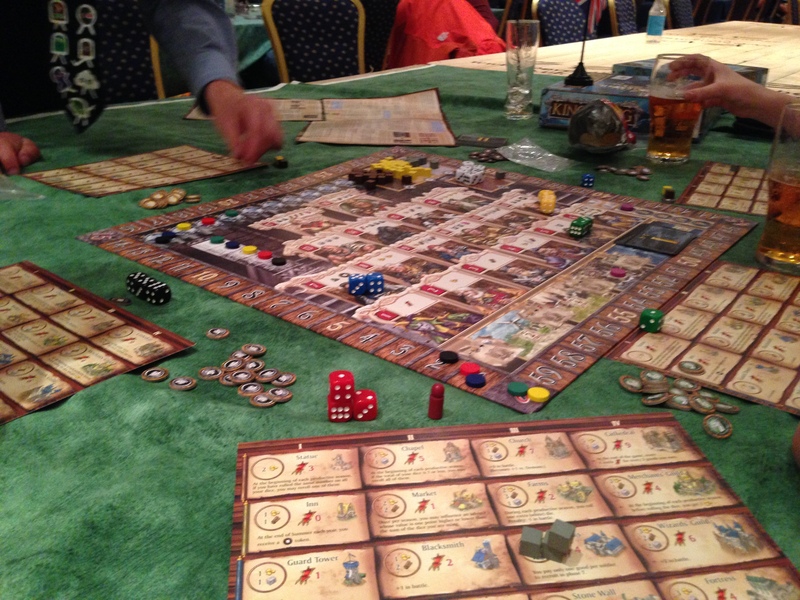 We’ve just arrived back from our little adventure in London for Dragonmeet 2014! It was great to see so many people turn-up to this event! 1500+ I believe I heard the noisy tannoy man announce! 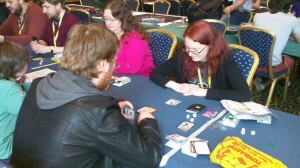 As well as meeting lots of new players, it was great to meet some returning faces and Kickstarter supporters who I’d only previously had contact with online. 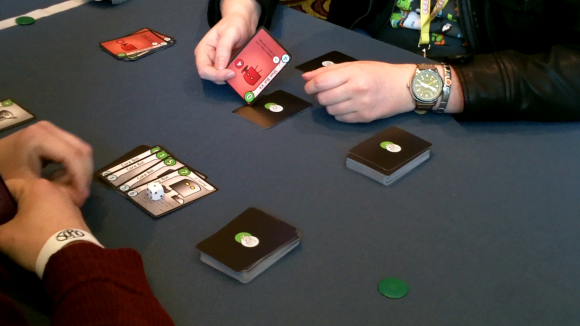 One of the upshots of having more experienced players was that we were able to play some of the different game modes throughout the day, rather than just endless single Stak games! 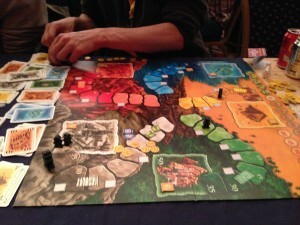 As usual I got bullied out of any 4-player games that happened (why do they always pick on the guy who made the game?! ), but the ensuing mayhem was fun to watch. 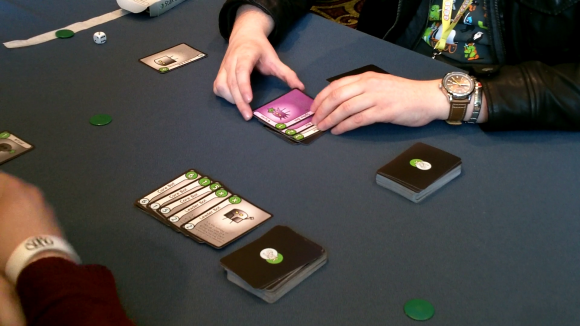 We also managed to play a little X-Ray Mode (where all of the cards are visible, and you offset them to show when they’re face-up. 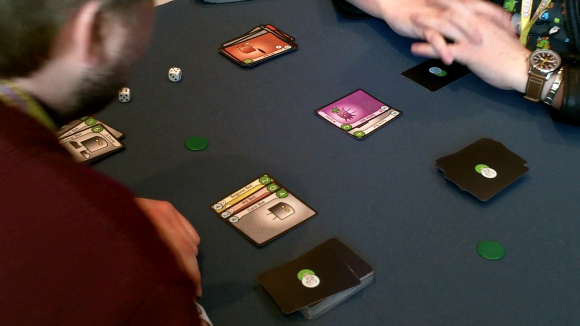 Watch this Video link to learn more), with a player who wanted a bit less randomness in the game. As usual I hardly got to see any of the rest of the convention, but I generally take this to be a good sign as it means we were busy playing at the stand! I did manage to catch-up with a few people though and even managed to return with a couple of games including extra sets of the awesome lords of war and a fun-looking prototype from Rack & Pinion. 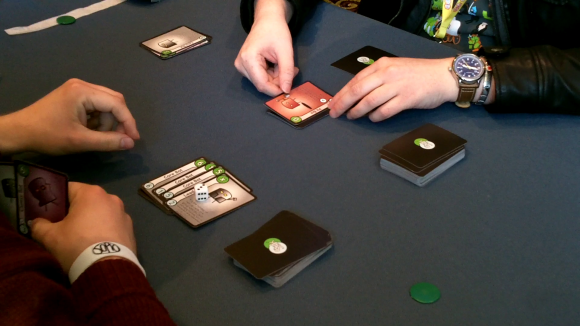 Also managed to squeeze in an interview with the guys at Rollin’ Dice about the benefits of digital vs physical gaming and met the flat-capped face of Dark Cleo Productions. So all in all a great event, well done to the organisers for expertly gathering and handling so many people and we’ll hopefully see you all there next year! 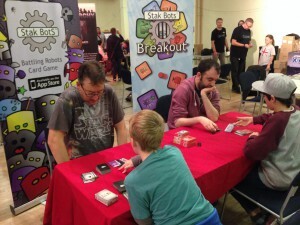 We had an awesome time at the UK Games Expo; sadly we didn’t get to check out too much of it, but that is because we were incredibly busy demoing Stak Bots! There was a massive turnout at the event, especially on the Saturday, when there was a constant sea of people in front of the stand. 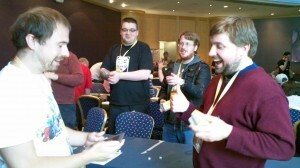 It was great to see so many people in the mood for gaming! It was also nice catching up with a lot of people we’d met during the year at other events and to see some returning faces from our launch a year before at UKGE 2013! 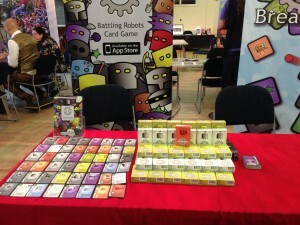 I was heartened to hear so many people say they’d been enjoying the game and to see their eager faces as they snapped up the next set of Bots in the Yellow expansion! 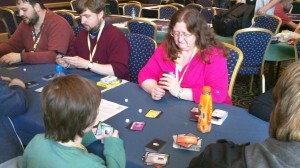 I also had the pleasure first thing Saturday morning of a video interview with Liz from nearlyenoughdice.com, setup by Chris at the UK Gaming Media Network. You can watch that here. Somehow I think we managed the whole interview without the camera being kicked by the throng of passers by! 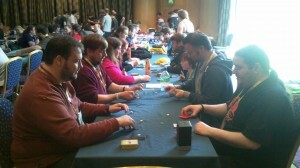 To those that I didn’t manage to catch up with over the weekend, see you at another event or even next year at UKGE 2015!! We ran the first official Stak Bots tournament on the Sunday afternoon, thankfully assisted by the expertise of Gary Cambell-Smith from KD Games, whose long-enduring miniature laptop saw us through the event! We squeezed in 3 rounds in a swiss format before the semi-final, playing single Stak reactive with a 15 minute time-limit per match-up, best of 3 (or until out of time). Congratulations to them all! 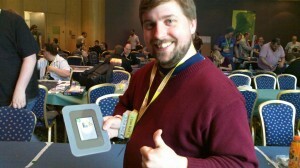 They each left with a pack or two of Stak Bots as a prize and Andrew gained a unique framed copy of Champion Bot! Below are a few piccies including some shots of the final! Game 1: Andrew’s starting offence! Andrew’s Core Bot is strong enough to take out both of Alan’s defenders and win him the first game! 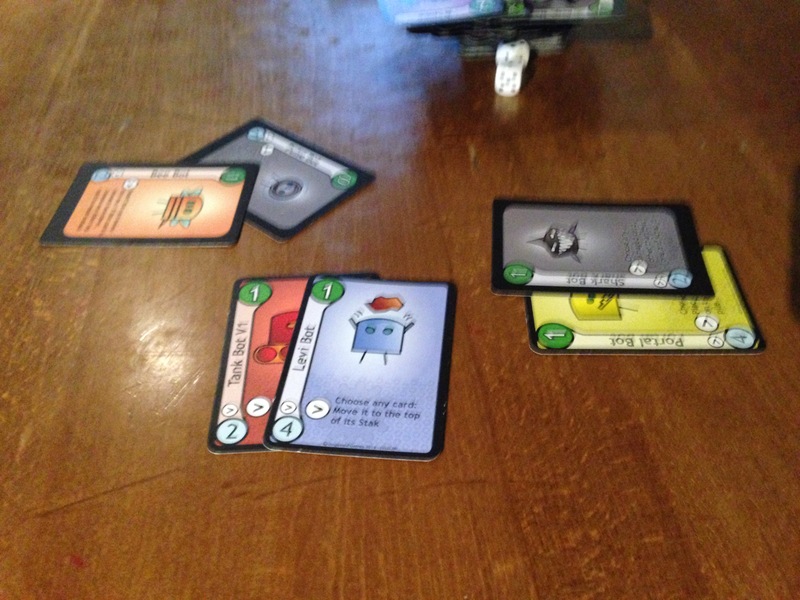 Game 2: A Bountiful Bot allowed Andrew to setup a couple of strong Leader Bots! Alan takes them on with Spike Bot. Alan pitting a damaged Leader Bot to finish it off! Andrew pushes the offensive with a giant power 7 Stomp Bot! Alan’s last defence isn’t powerful enough to take out Andrew’s Clumsy Bot. It’s all over! Andrew wins! Our very excited tournament winner! 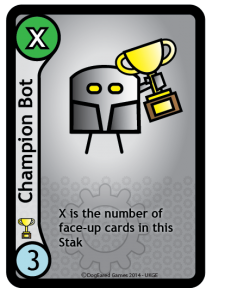 (And yes, technically current world champion of Stak Bots :p ). UK Games Expo 2014 Tournament and other awesomeness! The UK Games Expo is nearly upon us! 1. The Yellow Expansion officially launches! Those who were kind enough to back the project on Kickstarter have already been enjoying the new Bots, but they will be on sale officially for the first time at our stand at the expo and also available to retailers through our distributor Esdevium Games. 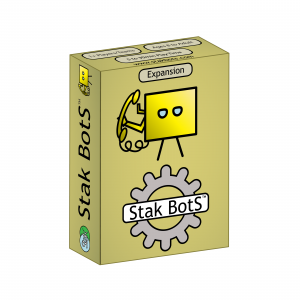 It features 16 new Bots across 60 cards, a number of new game variations and toggles, and brings so many new options with deck-building! Join us for a game at the stand at the expo! 2. The first official Stak Bots tournament is happening at the Expo! There are prizes for the top 4 places and the winner will be getting a uniquely printed card, made specially for the event! 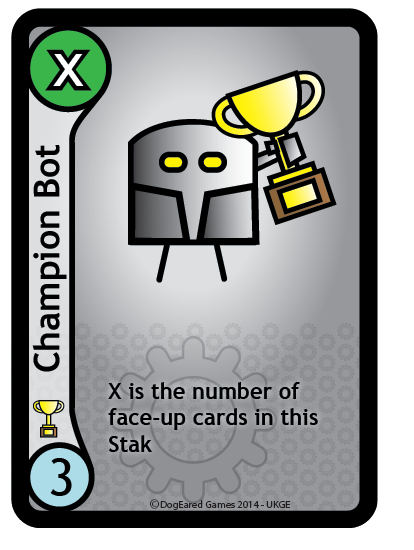 Champion Bot has all the strengths of Leader Bot, but none of its disadvantages! (Consequently its rank is slightly higher). No longer must you fear Pit Bots and Tranq Bots! There will be more Champion Bots appearing in the future, but they will only ever be awarded to the winners of the larger tournaments. Each will have its own text at the bottom, to show where and when it was won, so even though there will be more in the future, each will be a unique card! 3. 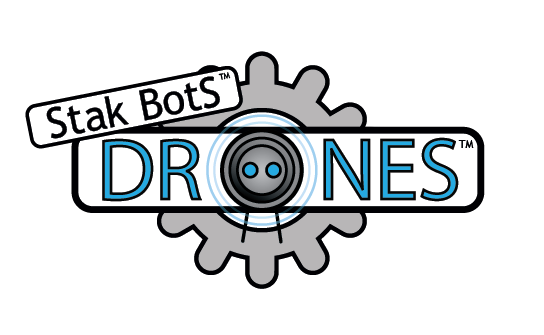 Stak Bots – Drones is coming to your web browser! 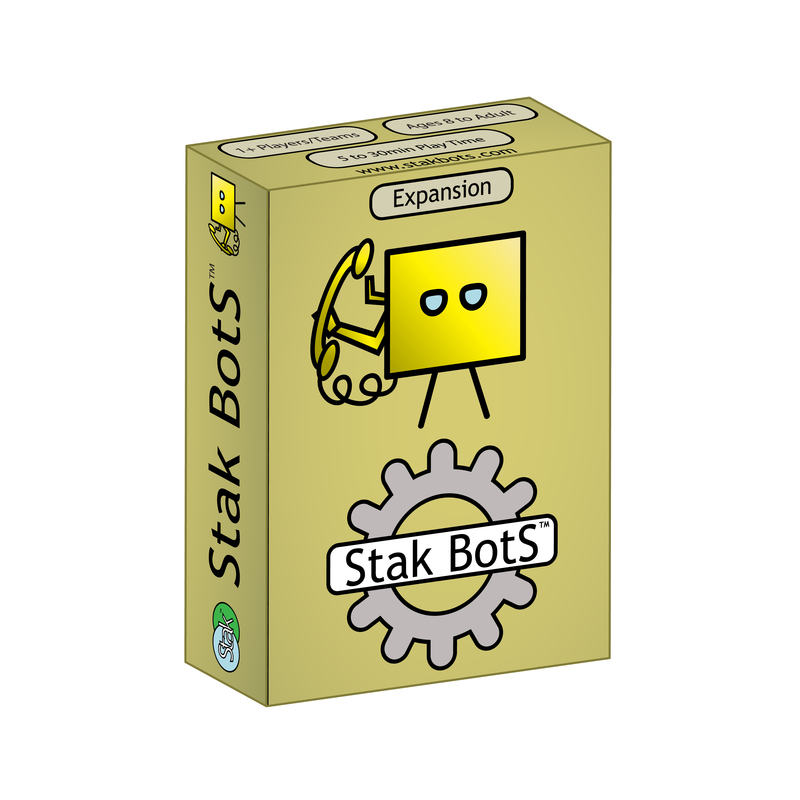 Built on the 1-player / solo / solitaire mode listed in the Yellow Expansion rules, Drones will see your single Stak battling multiple Drone Staks! 4. 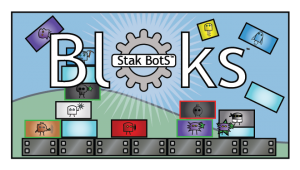 Stak Bots – Bloks is also coming to your web browser! 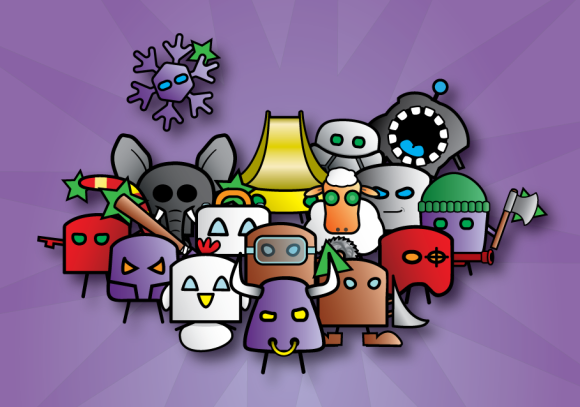 See the Bots like never before, across many levels in this crazy physics based puzzlish adventure! Each Bot stays true to its functions in the card game; use Levi-Bot to lift Bloks to the top of the screen, aim carefully with Shot Bot, cause extra destruction with Bash and Spike, or watch Clumsy do its thing! It also sees the debut of Quake Bot, Rocket Bot, Bomb Bot and Jump Bot! Again, release date is TBC, but check back here soon! 5. 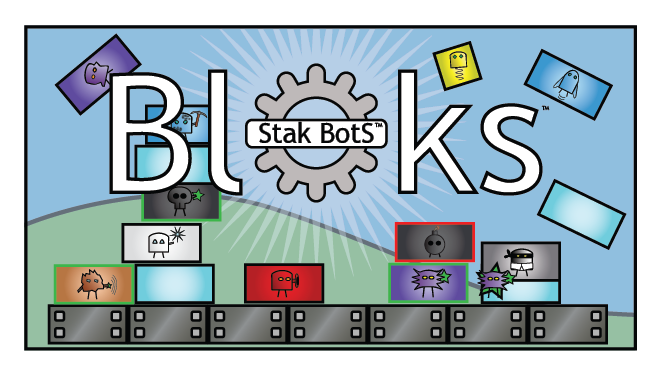 Stak Bots IOS gets a re-release! Within a week or two, the ever-addictive IOS app will be getting a re-release as a paid app with various fixes and tweaks. What do you get for your money? No more IAPs!!! Yay! Everything is unlocked; custom decks, all the Bots and no adverts. All for the cost of one unlock on the free app. Can I keep using my free version? Yes. But please consider buying the new version; you’ll benefit from the bug fixes and also be supporting the game; the more downloads we get, the sooner we will be able to add more Bots to it! Is that enough exciting news for you?! I hope so, I’ve been too busy sorting all this out to do much else! 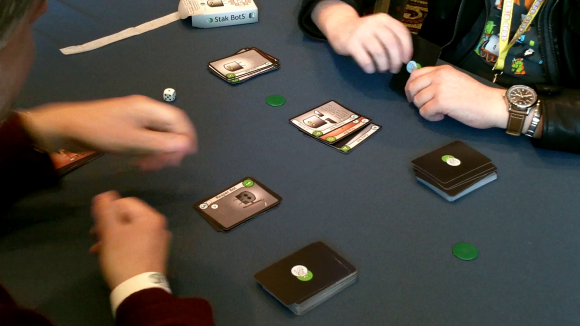 Each player will have just one Stak, 9 cards deep, with 3 cards in hand. 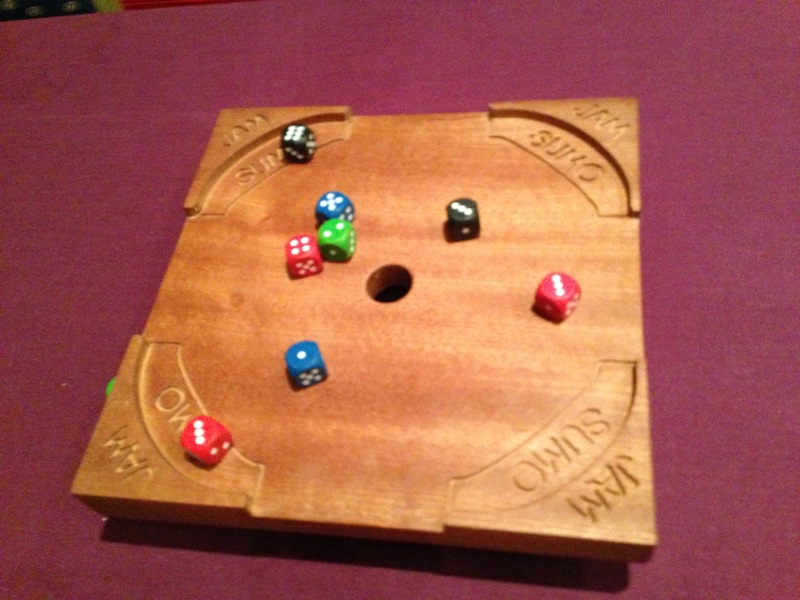 Roll a dice to determine the player who goes first each round; that player does not draw a card on their first turn. Each player will need a deck of 60 cards, with 10 of each rank and no more than 5 copies of a specific card (e.g. Core Bot rank 4). 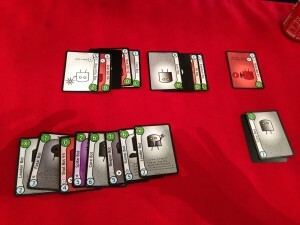 Only cards from the original and expansion packs are to be used (sorry, no Magnet or Backer Bots; Magnet is over-powered for single Stak and Backer Bot involves swapping of card ownership so could cause problems!!). 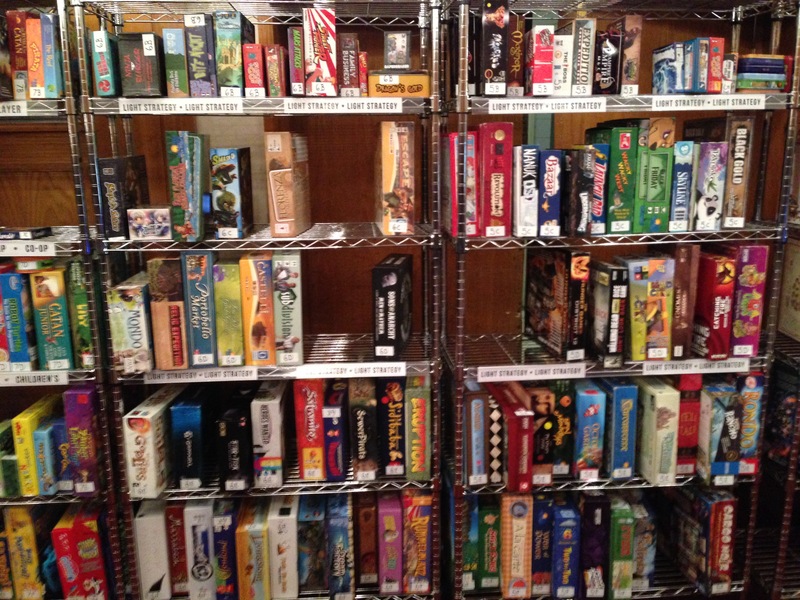 The original and expansion packs would each be suitable to use on their own, or as a good starting point to modify.